Since Mariner 9’s pioneering first mission to survey the surface of Mars, several have followed with more advanced equipment able to unveil more detail. This was in a bid to better understand the underlying processes that formed the features of the red planet, including aeolian structures such as sand dunes. Launched in 1971, the Mariner 9 mission had two primary objectives. Firstly, to map 70% of the Martian surface (originally the objective of the failed Mariner 8 mission) and to study temporal changes in the Martian atmosphere and surface. In terms of mapping, the mission exceeded expectations, managing to capture images of almost 100% of the surface. This revealed aeolian features and also large canyons, massive volcanoes and ancient riverbeds. 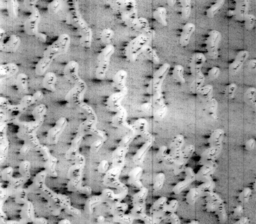 Despite this success, Mariner 9’s wide and narrow angle telescope cameras could only capture so much detail. The images created had at best a resolution of 1km, and with 5% of the surface this accuracy reduces to 100km. Although this is perfectly adequate to discover large geological features and entire aeolian systems, it is not detailed enough to study dunes in any great depth. NASA’s Viking Mission to Mars was composed of two spacecraft, Viking 1 and Viking 2, each consisting of an Orbiter and a lander. The mission objectives were to capture high-resolution images of the Martian surface, characterise the structure of the atmosphere and surface, and finally to search for signs of life. Launched in 1975, Viking 1 and 2 Orbiter spacecraft orbited Mars at a distance of 300km above the surface for 1400 and 700 rotations respectively, returning images of the entire surface of Mars with a resolution of 150 to 300m. At selected points of interest, this resolution was improved to an impressive 8m. The results from Viking gave us the most complete view of the Martian surface to date. 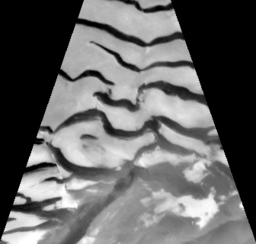 The Orbiter images confirmed the existence of volcanoes’, canyons and aeolian features as well as discovering large cratered regions and even evidence of surface water once existing. It meant that these features could be studied in greater detail, and specific regions of sand dunes and sand dune types were discovered. Launched in 1996, the Mars Global Surveyor spacecraft was NASA’s first mission to Mars in 20 years. It is still the longest serving mission to date, successfully observing the surface for over nine years until November 2006. It was designed to circle in a polar orbit around the planet (travelling over one pole to the other) twelve times a day collecting images from a height of 400km. The aim of the mission was to contribute to the four main goals of Martian exploration at the time: determine whether life ever existed on Mars, characterise the climate of Mars, characterise the geology of Mars and prepare for human exploration. To help achieve this, the surveyor spacecraft was fitted with some of the most advanced instrumentation ever sent into space. Part of this payload was the Mars Orbiter Camera (MOC). This camera had two functions; firstly to take a daily wide-angle image of Mars, similar to the weather photographs seen of Earth, in order to study the climate, and secondly to take narrow-angle images to better understand the geological features. As with the previous two Martian missions, the Global Surveyor was a great success. The landmark discovery was to be the existence of gullies and debris flow features, suggesting that there could be current sources of liquid water on or near the surface of the planet. This wasn’t to be its only achievement however, as it returned images of the surface down to a resolution of 0.5m. The most detailed so far, they provided new information about the physical nature of the windblown material on the Martian surface and showed that the pre-MGS view was much too simple. In addition to bright dust and dark sand, MOC images show evidence of bright sediment that can be transported by saltation (e.g., sand) and dark material that can be transported in suspension. Part of NASA’s ongoing Mars Exploration Program, the Mars Odyssey spacecraft launched in 2001, and is still observing the planet to this day. As with MGS, its aim again is to contribute to the four main goals of exploration, and to do this five mission objectives have been derived: to globally map the elemental composition of the surface, determine the abundance of hydrogen, to acquire high spatial and spectral resolution images of mineralogy, provide information on the morphology of the surface and to characterise the radiation risk to human explorers. The Odyssey spacecraft was fitted with three main instruments to help achieve its targets. THEMIS (Thermal Emission Imaging System) is a camera used to identify the mineralogy of the planet, by studying the different heat radiation properties present. GRS (Gamma Ray Spectrometer) for determining the presence of 20 chemical elements on the surface including hydrogen, and finally MARIE (Mars Radiation Environment Experiment) for studying the levels of radiation present. Although at first glance none of these instruments seem suitable for the study of aeolian features such as sand dunes, the THEMIS camera also surveys the surface through the visible spectrum. The resulting images have a resolution of 18m, and to date the camera has taken over 15,000 20x20km shots. This resolution nicely ‘fills the gap’ between the large-scale images of the Mariner and Viking missions and the very-high resolution images of the MGS instrumentation. Launched from Cape Canaveral in 2005, the Reconnaissance Orbiter’s main objective is to search for evidence that water persisted on the surface for a length of time. While previous missions have shown that water flowed across the surface, it remains a mystery whether water ever existed long enough to support life. The MRO spacecraft is one of the most comprehensive missions ever sent to Mars, with a payload of many different types of instrumentation. As well as the numerous spectrometers, radiometers, radars and engineering instruments on board, three cameras have been included to fulfil a variety of objectives. MARCI (Mars Colour Imager) takes large-scale images of the planets atmosphere in order to study clouds and weather patterns. Two other cameras, HiRISE (High Resolution Imaging Science Experiment) and CTX (Context Camera), are able to take images of a much more suitable resolution to study aeolian features in detail. HiRISE, as the name suggests, takes ultra-high resolution images of the Martian surface in order to reveal details of the geologic structure of canyons, craters and aeolian features. Able to produce results at a 0.5m resolution, it has so far returned some of the most detailed and striking images of the Martian surface ever captured. CTX was designed to be used in conjunction with HiRISE, providing wide-area views of the areas being studied in order to provide a context for the high-resolution analysis of key areas of the surface. Although predominantly an auxiliary instrument, CTX produces good quality images in its own right, and has currently returned data for over 50% of the planet at a resolution of 6m. 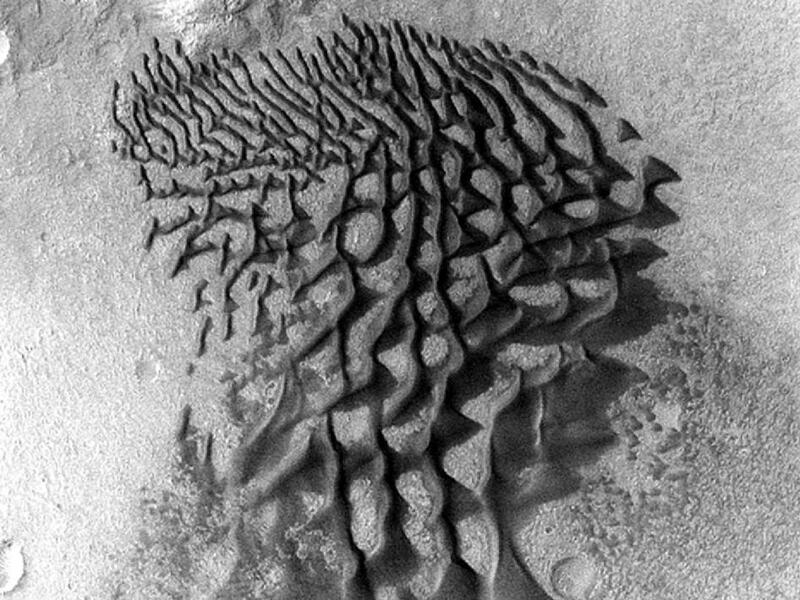 Although not matching the detail of HiRISE, they still can still be used to study sand dunes in detail while having a much-improved field of view.